“Collection of a Gentleman of Nottinghamshire;” (his sale, Christie, Manson & Woods, London, 1846). probably acquired 1878 by H. Smith Wright, Nottingham. Thomas Wright [1773-1845], Upton (Apton) Hall, near Southwell, Nottinghamshire. (sale, Sir George Donaldson, London, 1906); purchased by William A. Clark [1839-1925], New York; bequest 1926 to the Corcoran Gallery of Art, Washington; acquired 2014 by the National Gallery of Art. The 1846 and 1906 sales were given in Dana H. Carroll, Catalogue of Objects of Fine Art and Other Properties at the Home of William Andrews Clark, 962 Fifth Avenue, Part II, Unpublished manuscript, n.d. (1925): 219, no. 317; original manuscript in The Corcoran Archives, Special Collections Research Center, George Washington University Libraries, Washington, DC; copy in NGA curatorial files. Loan to display with permanent collection, Corcoran Gallery of Art, Washington, 1906-1909. Hudson-Fulton Celebration, The Metropolitan Museum of Art, New York, 1909, no. 18 (catalogue entry has the dimensions of no. 19, NGA 2014.136.34). Loan Exhibition: Masterpieces from the Corcoran Gallery of Art, A Benefit Exhibition in Honor of the Gallery's Centenary, Wildenstein Galleries, New York, 1959, catalogue without checklist. 25th Birthday Exhibition: Treasures in America, Virginia Museum of Fine Arts, Richmond, 1961, catalogue without checklist. Masters of Landscape: East and West, Munson-Williams- Proctor Institute, Utica; Rochester Memorial Art Gallery, 1963, no. 23. The William A. Clark Collection: An exhibition marking the 50th Anniversary of the installation of The Clark Collection at The Corcoran Gallery of Art, Corcoran Gallery of Art, Washington, 1978, catalogue without checklist. Masters of 17th Century Dutch Landscape Painting, Rijksmuseum, Amsterdam; Museum of Fine Arts, Boston; Philadelphia Museum of Art, 1987-1988, no. 37. Great Dutch Paintings from America, Royal Cabinet of Paintings Mauritshuis, The Hague; The Fine Arts Museums of San Francisco, 1991, no. 23 (shown only in San Francisco). Antiquities to Impressionism: The William A. Clark Collection, Corcoran Gallery of Art, Washington, 2001-2002,catalogue without checklist. Hofstede de Groot, Cornelis. A Catalogue Raisonné of the Works of the Most Eminent Dutch Painters of the Seventeenth Century. 8 vols. Translated by Edward G. Hawke. London, 1907-1927: 8(1927): 62, 210. Hofstede de Groot, Cornelis. Beschreibendes und kritisches Verzeichnis der Werke der hervorragendsten holländischen Maler des XVII. Jahrhunderts. 10 vols. Esslingen and Paris, 1907-1928: 8(1923): 55, no. 210. Valentiner, Wilhelm R. Catalogue of a collection of paintings by Dutch masters of the seventeenth century. The Hudson-Fulton Celebration 1. Exh. cat. Metropolitan Museum of Art, New York, 1909: 19, no. 18, repro. Valentiner, Wilhelm R. Catalogue of a Loan Exhibition of Paintings by Old Dutch Masters Held at the Metropolitan Museum of Art in Connection with the Hudson-Fulton Celebration. New York, 1910: 85, no. 18, repro. Carroll, Dana H. Catalogue of Objects of Fine Art and Other Properties at the Home of William Andrews Clark, 962 Fifth Avenue. Part II. Unpublished manuscript, n.d. (1925): 219, no. 317. Corcoran Gallery of Art. Illustrated Handbook of the W. A. Clark Collection. Washington, 1932: 41, 47, repro. Breckenridge, James. D. A Handbook of Dutch and Flemish Paintings in the William Andrews Clark Collection. Washington, 1955: 21, repro. Corcoran Gallery of Art. Masterpieces of the Corcoran Gallery of Art. Washington, 1959: 11, repro. Virginia Museum of Fine Arts. A brief chronicle of the 25th Birthday Celebration and Catalogue of the Anniversary Loan Exhibition, Treasures in America, at the Museum from January 13 to March 5 of 1961. Richmond, 1961: 63, repro. Masters of Landscape: East and West. Exh. cat. Munson-Williams-Proctor Institute, Utica; Memorial Art Gallery, Rochester. Utica, 1963: 30, no. 23, repro. Dobrzycka, Anna. Jan van Goyen, 1596-1656. Poznań, 1966: 111, no. 164. Stechow, Wolfgang. 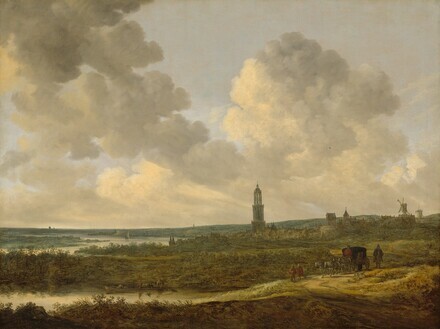 Dutch Landscape Painting of the Seventeenth Century. Kress Foundation Studies in the History of European Art 1. London, 1966: 41, 482, no. 71, repro. Beck, Hans-Ulrich. Jan van Goyen, 1596-1656: ein Oeuvreverzeichnis. 4 vols. Vol. 2: Katalog der Gemälde. Amsterdam, 1973: 2:188-189, no. 387, repro. Haverkamp-Begemann, Edgar. "Jan van Goyen in The Corcoran: Exemplars of Dutch Naturalism." In The William A. Clark Collection: An Exhibition Marking the 50th Anniversary of the Installation of the Clark Collection at the Corcoran Gallery of Art, Washington. Exh. cat. Corcoran Gallery of Art, Washington, 1978: 51-59, no.40. Deys, H. P. Achter Berg en Rijn. Over boeren, burgers en buitenlui in Rhenen. Rhenen, 1966: 30, no. 68. Sutton, Peter C. A Guide to Dutch Art in America. Washington and Grand Rapids, 1986: 298-299, no. 450, repro. Beck, Hans-Ulrich. Jan van Goyen, 1596-1656: ein Oeuvreverzeichnis. 4 vols. Vol. 3: Ergänzungen zum Katalog der Handzeichnungen und Ergänzungen zum Katalog der Gemälde. Doornspijk, 1987: 3:187, no. 387. Sutton, Peter C., et al. Masters of Seventeenth-Century Dutch Landscape Painting. Exh. cat. Rijksmuseum, Amsterdam; Museum of Fine Arts, Boston; Philadelphia Museum of Art. Boston, 1987: 329-330, no. 37, color repro. Broos, Ben P. J., ed. Great Dutch Paintings from America. Exh. cat. Royal Picture Gallery Mauritshuis, The Hague; Fine Arts Museums of San Francisco. The Hague and Zwolle, 1990: 245-248, no. 23, repro. E. de Jongh. "Nationalistiche visies op zeventiende-eeuwse Hollandse kunst." In S. C. Dik and G. W. Muller, eds. Het hemd is nader dan de rok: zes voordrachten over het eigene van de Nederlandse cultuur. Assen and Maastricht, 1992: 74-75, no. 10, repro. Buijsen, Edwin, ed. Tussen fantasie en werkelijkheid. 17de eeuwse Hollandse landschapschilderkunst / Between Fantasy and Reality: 17th Century Dutch Landscape Painting. Exh. cat. Tokyo Station Gallery, Tokyo; Kasama Nichidō Museum of Art, Kasama; Kumamoto kenritsu bijutsukan, Kumamoto; Stedelijk Museum De Lakenhal, Leiden. The Hague and Leiden, 1993: 184, repro. Sutton, Peter C., and John Loughman. El Siglo de Oro del Paisaje Holandés/The Golden Age of Dutch Landscape Paintings. Exh. cat. Fundación Colección Thyssen-Bornemisza, Madrid, 1994: 118, no. 26, repro. Coyle, Laura, and Dare Myers Hartwell, eds. Antiquities to Impressionism: The William A. Clark Collection, Corcoran Gallery of Art. Washington, DC, 2001: 23, 66, repro. Spolsky, Ellen. Satisfying Skepticism: Embodied Knowledge in the Early Modern World. Burlington, 2001: 147-148, no. 7.5, repro. Suchtelen, Ariane van, and Arthur K. Wheelock, Jr. Pride of Place: Dutch cityscapes of the Golden Age. Exh. cat. Royal Picture Gallery Mauritshuis, The Hague; National Gallery of Art, Washington. Zwolle, 2008: 114-115, 224, no. 19, repro.